Every area of a vehicle comes with its own challenges for manufacturers and suppliers. The underbody is an often-overlooked area. Underbodies? Thanks to Röchling Automotive, this terminology may have to be fundamentally changed, as interior floor, underbody, and chassis are combined into one component. This development arises from automotive manufacturers’ desire to reduce weight and improve aerodynamics. While the overall construction of vehicles has changed very little over a long period of time, the materials used and their degree of integration has seen much more rapid innovation. 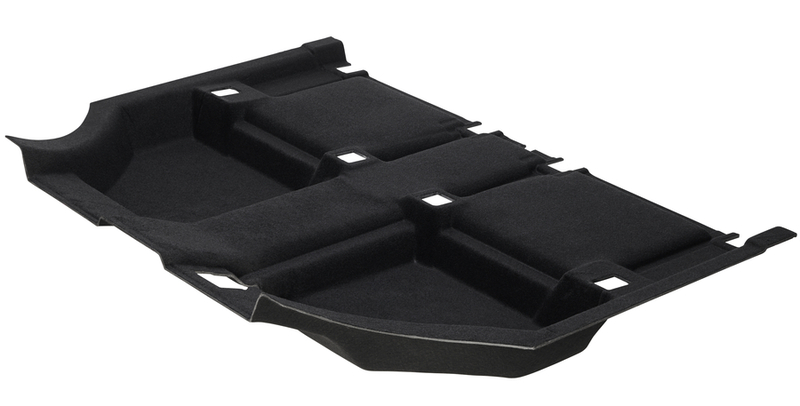 Röchling Automotive can combine the functions of the interior floor, underbody, and chassis by using floor elements made of Stratura. Röchling Automotive is also working on the integration of metallic elements as well. A special focus is being placed on the lightweight electric cars of the future. With these cars, every kilogram counts. Röchling Automotive can already serve these needs with several sample components with various material structures. The supplier was a participant in the Light eBody project, for instance. As part of this project, which focused on sustainability and efficiency, multiple supplier companies and automotive manufacturers worked on the development of an industrial-scale lightweight body for an electric vehicle. Röchling’s floor element made from Stratura combines the interior carpeting, acoustic insulation material, and the chassis floor plate. Whether floor plate or underbody, the rise of alternative drive concepts has lead to a redesign of this part of a vehicle. Keeping an eye on the development of the technologies and assembly of the vehicles is not always easy for suppliers. Röchling Automotive offers a unique range of solutions based on different material concepts and production technologies, such as advanced compression molding, injection molding and combinations. Assembly and connection concepts are also essential components of this fully rounded range of offers. Even thermoformed components made from high-density polyethylene (HDPE) can be manufactured. Whether low-cost solutions, where aerodynamics is particularly important, or highly integrated complex systems – Röchling focuses on the expansion of its capabilities. That is why we have consistently developed the skills that are necessary for the calculation and simulation of stresses and loads. The floor element made of Stratura combines the floor carpeting, acoustics insulation material, and chassis floor plate.